Gigi: My nails are just fine, thank you very much! The other day as I was watching the girls perch on a homemade jungle gym, I noticed Gigi’s toe nails seemed long. Instead of laying on the surface on the wood, aligned with her toes, the nails seemed to curl sideways. After watching a tutorial, and consulting photos illustrating the proper length and appearance of chicken nails, I decided something needed to be done. When Matt came home, I told him he would be the chicken holder in my scheme to trim Gigi’s nails. Surprisingly, Matt didn’t fight it. Normally he would say I was overreacting, and that her nails were just fine. But this time, he just shrugged, and walked out into the yard. Gigi let me grab her easily. I had Matt hold her on her back, just like I saw in the video. In my pocket, I had a vial of styptic power (in case I cut the quick), a folded paper towel (also for possible bloodshed) and my dog Charlie’s nail clippers. The first nail went well. I barely trimmed anything off. She didn’t even squirm. Suddenly her nails didn’t seem that long. I hesitated, wondering if I should proceed. But here was my chicken, presenting her sideways nails, and I just went with it. I carefully clipped the next nail. The bleeding was intense. I poured a small pile of powder into the paper towel, and dipped the nail in it. I then worked quickly to clip the rest of the nails. By the time I finished, blood was everywhere. It was dripping on the ground. It was on my shirt, on my hands. I looked at Gigi. Surely, this was freaking her out. And she was sleeping! Completely missing out on all the drama. Matt continued to cradle Gigi, as I dipped her wounded nail in pile after pile of the powder. The blood just seeped through. Finally, I put the nail in a huge amount of the powder and held it tight. I took Gigi from Matt and held her close, softly apologizing for hurting her. It took about 20 minutes before the bleeding stopped. I gingerly put Gigi on the ground, and held my breath. 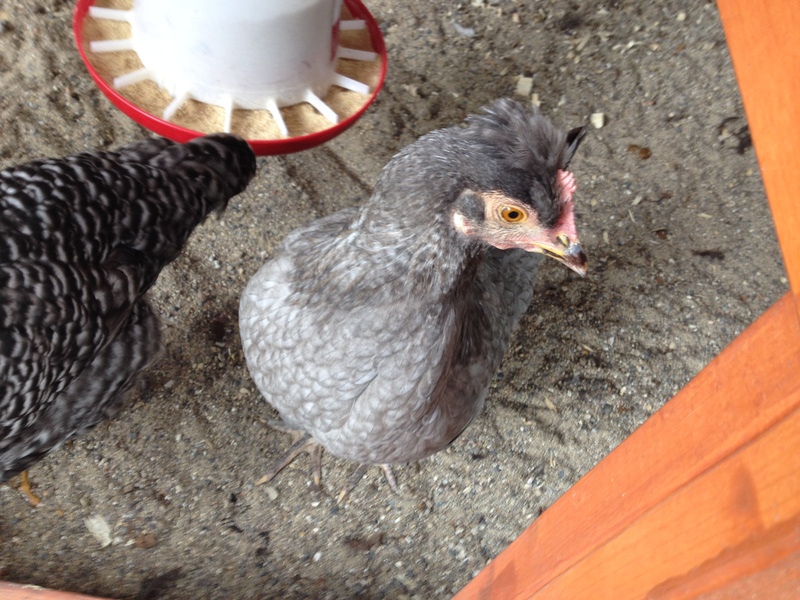 She looked at me, then scurried off in a chicken waddle to join Loretta and Nellie. No limp, no trouble scratching. Hopefully she won’t have a long memory, like my old dog Lexie, who refused to let me touch her her toes FOREVER after I made her bleed. All that was left was the cleanup. It took me three passes to get all the blood off my hands. And I’m happy to say Matt never rubbed my nose in it. 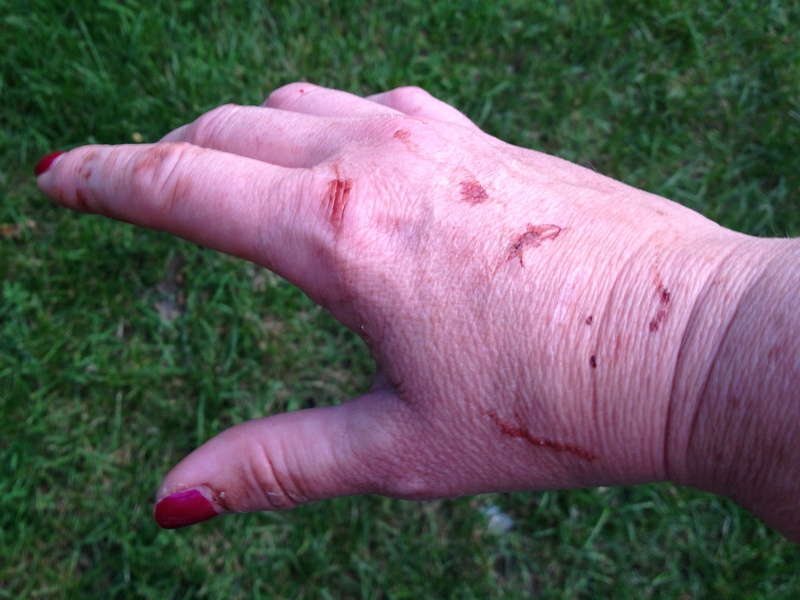 I’ve since read online that even a bad bloody nail trim is never enough to kill a chicken. We trim parrot talons, usually without bloodshed a- for them. plenty for us, as they get really pissed and bite with big beaks. Aww, man. That’s terrible!! I am so grateful that Gigi slept through most of it. Surely, I deserved a scratch or two!